An often forgotten story of World War 1 is the role civil servants played. Of course many went to war, but more importantly many played an unheralded but vital role keeping the fabric of country running, just by keeping the lights of government on. 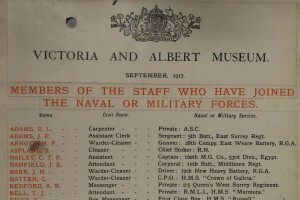 The History of Government site explores how civil servants kept departments functioning during WW1, which staff were allowed to enlist and which were not, and touches on the problems faced by those who fought the war from their desks rather than the Western Front.